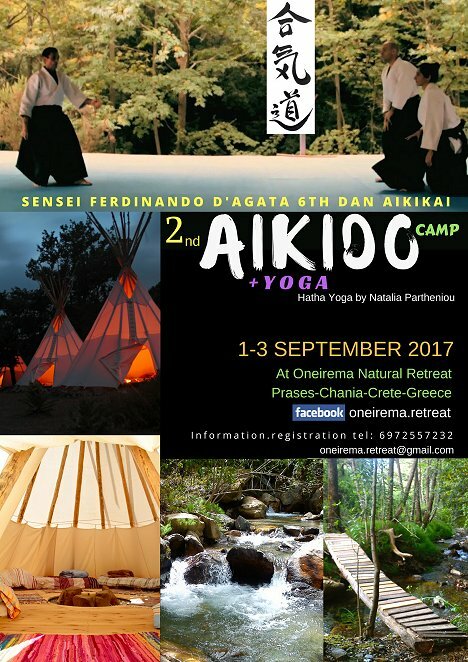 The Oneirema Natural Retreat and Aikido Dojo Nippos together organize the second Aikido camp in Crete. in the Indian tents (Teepees). Aikido exams at Haniá Dojo on October 2013. Aikido exams at Haniá Dojo on June 25, 2012. Aikido exams at Haniá Dojo on June 21, 2009.
on October 17, 2010 (Part 1 - white belts). on October 17, 2010 (Part 2 - black belts). Aikido Camp at Oneirema Retreat, Prasses on September 9-11, 2016. Ferdinando D'Agata at Hania Dojo on October 2013. Special Aikido class Bokken at Nippos, October 2012. Aikido seminar at Haniá Dojo on December 13-14, 2008. Free Aikido seminar at Haniá Dojo on February 10-11, 2007. Special Aikido class Jo and Bokken at Nippos, 2007. Special Aikido class Jo and Bokken at Nippos, 2006. Aikido seminar at Stalós Dojo on January 28-29, 2006. Aikido seminar at Stalós Dojo on June 4-5, 2005.